Electronic Onboarding with iConnect allows you to take control of the mountain of new hire paperwork and manage it online in your secure iRecruit database. Automate Communication with new hires. Improve Response Time and stay on top of onboarding tasks with iConnect’s reporting – always know which documents have been completed and which are still pending. Cut Mailing and Printing Costs Paper Documents. Reduce data errors with new hires completing the paperwork and verifying their data. Eliminate Data Entry into Sage HR. Save time, and hassle. 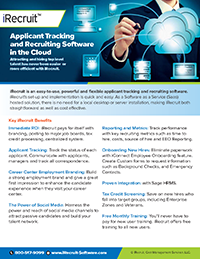 iRecruit enters 100+ fields into the Sage HRMS database. (Bonus) Secure, centralized system for storing new employee documents. Completed documents are available through iRecruit at any time where they can be kept stored online, printed, or downloaded. This entry was posted in Blog, iRecruit Blog and tagged electronic onboarding, iconnect, iRecruit, sage hrms. Bookmark the permalink.